A Gobi has a small brown bobby with black patterns. As this fish is living in its natural habitat close to the soil, often under orfe between stones, it is duly camouflaged there. In nature a Gobi will grow to a length of maximum 5 to 6 in; in a pond it will be somewhat smaller. They can reach an age of about maximum 5 years. A Gobi is sometimes sold as an algae eater. 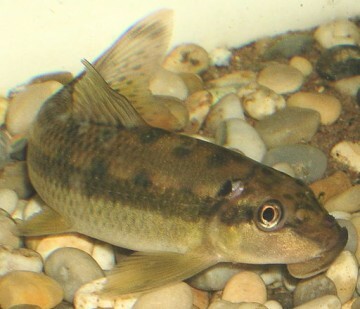 However, it is not a real algae eater, it mainly lives on insects, worms and little snails. Locally a pond should be 28 in deep enabling this fish to hibernate and in other places it should be shallow (8 in) for mating. A powerful filter is necessary because this fish likes clean water with a little flowing. You should keep them in a school of at least 6 specimens, however do not put them together with too big fish. A Gobi is sometimes sold as an algae eater. However, it is not a real one. It lives chiefly on insects, worms and snails.